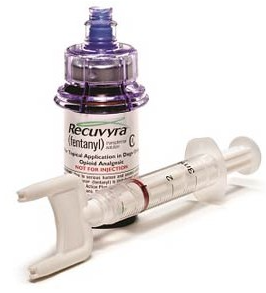 In today's VETgirl online veterinary continuing education blog, Dr. Garret Pachtinger, DACVECC reviews the top 3 new analgesia and anesthesia drugs you should know about for your veterinary patients. Veterinary team members understand the importance of analgesia in our patients not only to improve patient care and comfort, but to decrease morbidity and mortality. More now than ever with the opioid crisis and opioid shortage, veterinary professionals must be alert for newer medications which they can use in their anesthesia and analgesic protocols to improve patient care. In this blog we will review 3 of the newer medications available to veterinary professionals. 2) NOCITA - Nocita is an an extended-release bupivacaine product which has become popular recently with the concern for the opioid shortage. 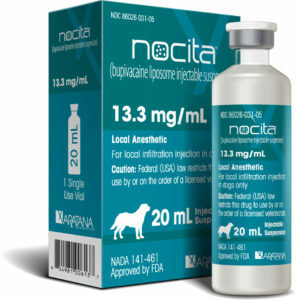 Nocita is a liposome injectable suspension used in the management of post-operative pain in dogs and cats. It is a local anesthetic that is injected directly into the surgical site, providing local pain control only where it is needed. Keep in mind, this medication is not without risk It is not recommended for use in breeding, pregnant or lactating patients. It should not be administered by intravenous or intra-arterial injection. Adverse reactions may include discharge from incision, incisional inflammation and vomiting. Please see the full Prescribing Information for more detail. 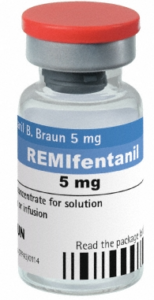 3) Remifentanil - Remifentanil is a synthetic opioid with direct action on mu opioid receptors. It has an ultrashort duration of action and elimination independent of hepatic or renal function. The half-life is approximately 6 minutes making Remifentanil an ideal choice for CRI delivery. The down-side? It's fairly expensive ($120/vial) and it must be administered as a constant rate infusion due to its extremely short duration of action. Please see the full Prescribing Information for more detail. As you would expect, the VETgirl team is very passionate about staying up to date on the veterinary literature and new treatment options that become available for our patients to improve our care, and their quality of life!